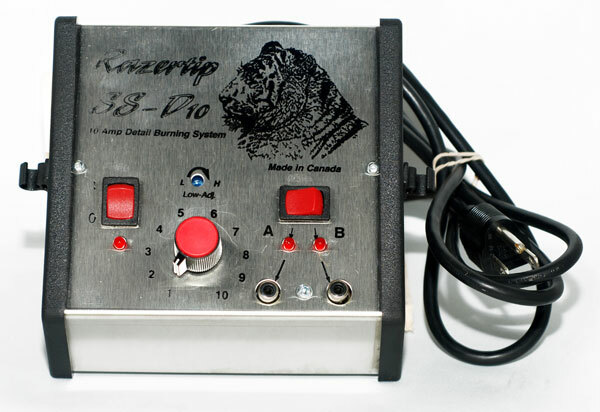 The SS-D10 is Razertip's workhorse, with many features not found on any other burner. Dual handpiece capability allows you to have 2 pens plugged in at the same time and change between them at the flick of a switch. This is particularly useful if your work calls for frequent handpiece changes as it saves time as well as wear on the connectors. 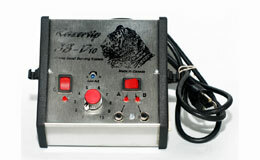 The SS-D10's extra low-end temperature adjustment allows you to turn the heat down further if the "1" setting is still too hot. If you are sculpting wax or detailing plastics, you'll love the extra range available on the low end of the SS-D10. Comes with #1L Fixed-Tip Pen and 18 guage cord. Don't let the SK's small size fool you. 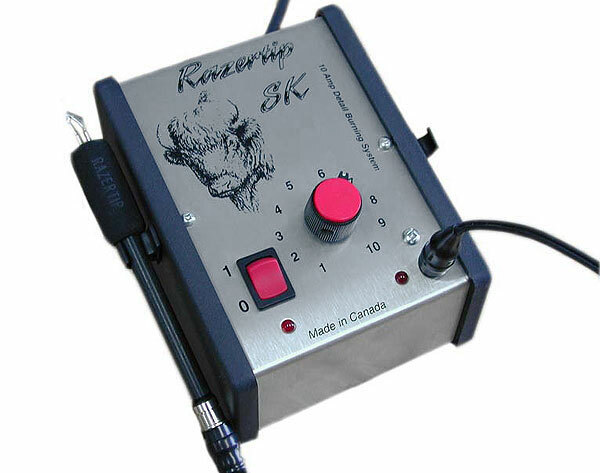 Packed with the same power and CSA c/us certified circuitry as the SS-D10, the SK is great as a starter unit or as a second burner for the serious artist. So what's the difference from the SS-D10? The SK will accept only one handpiece at a time, making it necessary to unplug and plug in handpieces when changing over, and it's lacking the extra-low-end temperature adjustment. Other than that, it's essentially the same unit as the SS-D10. Choice of regular or Heavy duty pen (at small extra cost) included. Available with your choice of hundreds of different tip types, Razertip pens have set the standard worldwide. The standard pens are the smallest, most comfortable and versatile pens made today. They are ideal for any application where fine detail is desirable. With front and mid-body ventilation ports, these pens operate up to 5 times cooler than Razertip's previous pens. For high-heat users, the new pen bodies will cool off much quicker than ever before. You won't find a more comfortable pen anywhere! With a larger pen body than the standard pens, HD pens are built for maximum durability. They have heavier connector posts and heavier tips. HD pens require a higher heat setting than most standard pens and are best used with a heavy-duty (HD) cord. While still capable of very fine detail, they are ideal for applications where the flat side of the tip is used (shading, quill-making, etc.) or in schools or clubs where inexperienced users can be hard on equipment.The fixed-tip heavy-duty pyrographic pens are a bit bigger, but they will take punishment like no other. One male connector on each end. This is the standard cord for Razertip burners & pens. 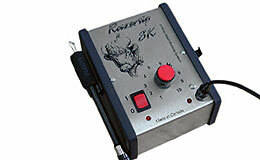 Available in FL (super flexible) 18 ga. with black plugs or in 16 ga. HD (heavy duty) with red plugs. Allows you to use Razertip pens on power supplies that have two 'U' connectors (Colwood). Connects Razertip pens on power supplies that have two banana connectors. Not available in HD. Adapts Optima, Colwood or Nibs pens to a Razertip standard cord. Adapts Detail Master or similar pen to a Razertip power supply. Adapts Razertip pens to Optima, Colwood, Burn Master or Nibs burners. 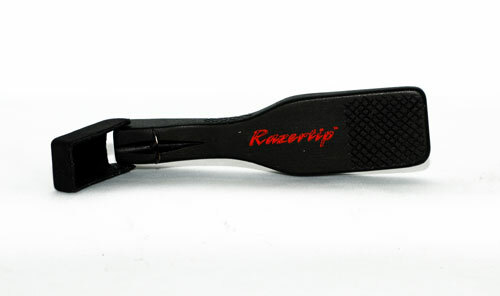 Tip Cleaner/Scraper: This ingenious tool removes carbon buildup from most sharp Razertip tips quickly and easily. Works without turning off the heat to your pen. Adhesive-backed handpiece clip attaches to your burner or other smooth surface - keeps your Razertip pens handy. Copyright © 2017 Nutmeg Woodworking and Carving Shop, Inc.